Rouviere Media project managed, did most of the design and developed this complex interactive infographic for the wind energy industry in collaboration with developer Christopher Muro. 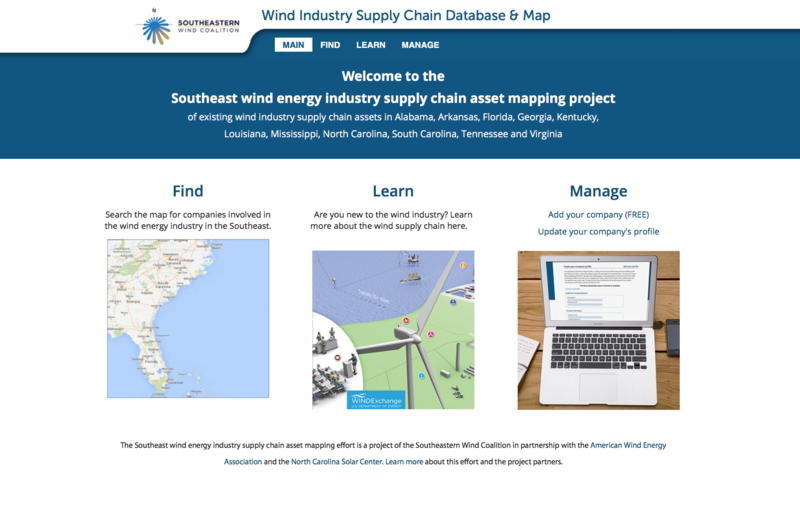 The project for the Southeastern Wind Coalition enables the various participants in the wind energy industry in the Southeastern United States to join together to grow the industry. The main feature of the infographic is a map with icons for various suppliers of products and services in the wind energy industry. The map has a table view that provides a list of all suppliers in selected categories. Users of the infographic can select categories and locations they are interested in and make a printable PDF report of the generated lists. The second part of the infographic is a clickable infographic. When an icon is clicked on, information about that sector of the wind energy industry appears. The third part of the infographic is a form that allows a supplier of goods or services to input their information into the database that feeds the map so that the information will appear on the map and in the tables.